Newly Remodeled Home- Quiet OKC neighborhood. All yours to enjoy! Rosemary Place is perfect for couples, solo adventurers, and business travelers. This newly remodeled house is used exclusively for AIRBNB & VRBO guests. We've got you covered with swanky new mid-century furnishings, shiny new appliances and brand washer and dryer. A new coffee maker awaits you for the quick cup of coffee in the morning. You can enjoy your coffee or tea on the front porch or kitchen. High speed WIFI, local channels and free Netflix. A desk with office supplies for after hours work. An iron and ironing board, hangers and plenty of drawers. Games, hair dryer, snacks, etc. Also, free private parking right in front of the house. The entire house is yours to enjoy. Self check-in is easy with push button combo lock. Front porch faces east and is complete with a couple of lawn chairs for relaxing. Back yard has a few more chairs and a large fully-fenced in lawn with rose beds in the summer. We are close by if needed and answer most calls and/or texts promptly. If we miss you, we will get back to you as soon as possible. We would like to respect your privacy but are available if needs come up. 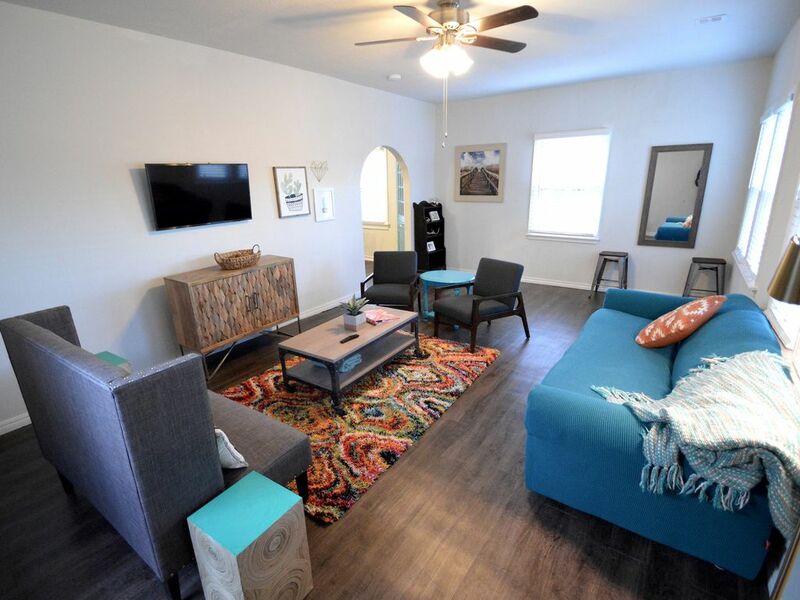 Quiet area of town with easy access to major highways, fabulous shopping, and downtown OKC. Close to area hospital and business districts. Tons of great restaurants just minutes away. Museums, zoo and tons of things to do in the area! Bathroom is complete with body bars, shampoo and conditioner. Also, we have toothpaste with extra toothbrushes and supplies including a hair dryer and more. A 4k Flatscreen Smart TV is available in the living room with local channels and free Netflix & YouTube. High speed WIFI available and a work desk complete with office supplies. The kitchen should have every thing you need. Gas cooking and microwave. The home is North of I-44 and south of NorthWest Expressway (3A) in the quiet Suggs Park Neighborhood. East of May and West of Penn. Maps will be provided for easy access around town. Uber or Lift are a great way to get to where you need to go! This is a no-smoking, no pet property. All house guests must be included on the original rental reservation and no parties of any kind are allowed. Quiet hours are from 10pm to 7am to respect neighbors. Thank you for helping us ensure Rosemary Place is kept in great condition for future guests! Rosemary Place is set up for business travelers and adventurers looking for a place to land! Nice front porch, layout, full kitchen and laundry area! Almost everything is new in this home and waiting to make you comfortable. Bath is complete with shower, vanity and plenty of towels and supplies. We also have a hair dryer. High Speed WIFI with two channels. Functional dishwasher is set up and ready to use. Brand new refrigerator and freezer. We have coffee in the freezer for you to enjoy! Gas cooking in the kitchen. Brand new microwave for a meal on the go! We have you covered with a new coffee maker! Dishes ready to go for a full meal and basic cooking. Kitchen has everything you need for a basic meal. Free Netflix and basic local channels. Spacious home, with everything you need (even kitchen cleaning stuff), nicely decorated, comfortable beds, TV in the living room with free Netflix, and washer/dryer in perfect condition (a plus for our family of 4). It was easy to feel at home in a short time. Even though it has a backyard, it is not easy to go out (only through the master bedroom), the condition is not great and there is no patio furniture to sit outside and enjoy a barbecue or a drink. This house has been remodeled so the floors and doors can be noisy. Having only one (rather small) bathroom for our family of 4 (one of my sons in crutches) could get complicated sometimes. The master bedroom is separated from the other bedrooms which is nice when you have kids, but it's next to the AC equipment room /laundry area (the noise can be very annoying) and there is no bathroom there. The house was clean though not as clean as I would have liked, especially windows, inside the microwave and oven, but I pushed for a much earlier check in time and that may have had an impact on the time for cleaning the house. The hosts were very communicative and were always making sure that we were OK. The location is very good, very quiet, and close to everything: target, mall, just anything you need. Great house. Super nice owners. Rented this house for a month for work and really enjoyed it. I stayed at this property for 2 weeks following the birth of my grandson to be near by daughter. This home is so clean. Comfortable beds. Netflix! And is convenient to everything you need. The property owners were wonderful to work with and made sure I had everything I needed. The washer and dryer were great to have during my stay. The kitchen is equipped well. Thanks for letting me stay with you! Older home, nice neighborhood, owners have done a lot to the property... would stay again. This was a great home away from home. Very spacious, clean and organized. The location was perfect for the activities we had planned. I traveled with my family of 4 and even had my grandmother with me and we all had a bed and place to sit. The beds were super comfy and my children loved that we had Netflix. Chad is easy to get in touch with and from the time of booking will do everything he can to make your stay perfect. We will definitely be back soon. This house and the owner do not dissapoint. A comfortable home away from home with all the amenities. Close to Fairgrounds, Plaza District, Major Highways, Hospitals, Museums, Parks, Zoo and much more! !